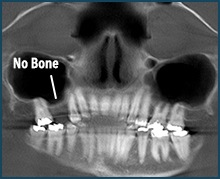 The height of bone in the back part of the upper jaw is usually insufficient to place the appropriate implant length. 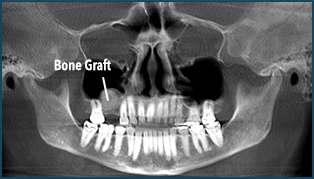 Therefore, in order to increase the amount of bone, a bone graft is performed within the maxillary sinus. A small window is made along the side of the upper jaw, the membrane that lines the maxillary sinus is raised, and particulate or particle bone is added. 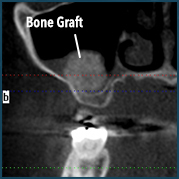 The particle bone is cadaver bone which needs about five to six months of healing before placing the implant. Sometimes autogenous bone (your own bone) is harvested at the neighboring site and mixed with the cadaver bone. Also, platelet rich plasama is mixed with the bone graft to enhance bone growth and healing. Sometimes, if there is sufficient bone height to place the implant but not enough to cover the entire implant surface, the implant can be placed at the same time as the maxillary bone graft procedure.